We so often hear tips and advice with regards to health coupled with the notion that they can help you live longer. While it is thought that just about anything that is good for us can help us prolong our lives, it is unclear as to how long our lives may be extended by. For example, what if eating an apple or going to the gym every day only added a week to your life? Well, according to experts, if we adopt just a few key habits, we may in fact add up to 15 years to our lives. I'd say that's well worth the effort. 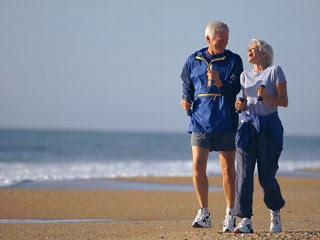 According to experts from Maastricht University in the Netherlands and their study that has been published in the American Journal of Clinical Nutrition, women and men who exercise regularly for at least 30 min per day, don't smoke, maintain a healthy weight (BMI between 18.5-25) and follow the Mediterranean Diet may outlive their less healthy counterparts by up to 15 years or 8.5 years respectively. In the study, women and men were assessed based on whether or not they smoked, their nutrition and exercise patterns and their body weights. It was found that the people who scored low on the measures had the same risk of death as people who were older, but scored high on the measures. What this suggests is that being healthier can help delay death by around a decade or more for both women and men. One of the most pervasive factors on the participants' health was their diet. Those who followed the Mediterranean diet lived the longest and it was found that consuming nuts, vegetables and alcohol had the greatest effect on their life expectancies. If you really think about it, it isn't that hard to make the necessary changes in your life that can help you live significantly longer. It is never too late to get started and every day that you live healthier is a step in the right direction and an investment into your future.